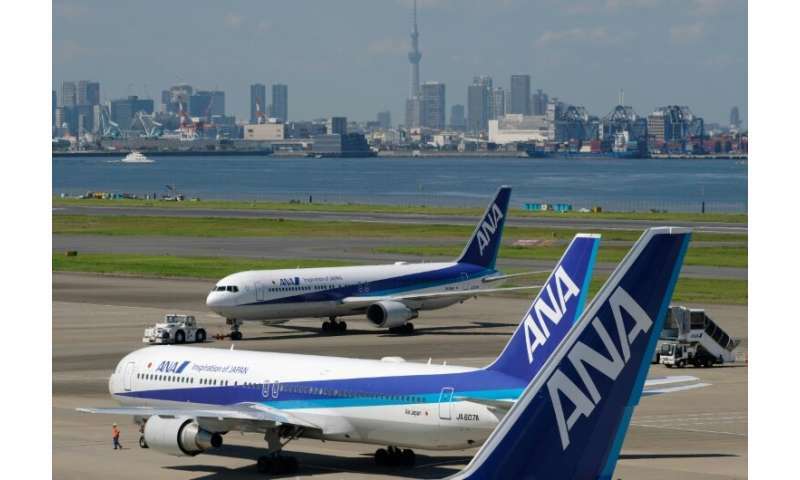 The operator of Japan's All Nippon Airways said Tuesday it has decided to order a total of 48 aircraft from Boeing and Airbus for deliveries from 2021 through 2025. ANA Holdings said it would buy 30 Boeing 737 MAX 8 planes and 18 Airbus A320neo units, citing growing demand in the region and increased inbound tourism to Japan. The company said the 30 Boeing jets would have a catalogue price of 383 billion yen ($3.5 billion), adding that the firm has so far confirmed orders for 20 units, with an option to buy 10 more. The 18 Airbus orders are all confirmed, but the engines manufacturer is yet to be decided, the company said. For now, the Airbus deal has a catalogue price of 166 billion yen, ANA Holdings said. The deal makes ANA the first Japanese buyer of the Boeing model, while the Airbus A320neo already serves ANA's international routes. The company praised the fuel efficiency of the two models. Separately, the Japanese firm also said it will spend $95 million to buy 9.5 percent of PAL Holdings, which operates flag carrier Philippine Airlines. "Asia is a key growth market and we believe Philippine Airlines is in an excellent operational position to capitalise on both the strong uptick in air traffic growth as well as the vibrant, expanding Philippine economy," ANA Holdings President Shinya Katanozaka said in a statement. For nine months to December, ANA Holdings said its net profit dropped 30.2 percent to 106.8 billion yen. The fall was due partly to comparison effects as the previous year saw special income related to making low-cost carrier Peach Aviation its subsidiary. The company also paid $58 million to settle a class action lawsuit in the US related to an anti-trust allegation. The firm's nine-month operating profit dropped 5.6 percent to 156.6 billion yen, while overall sales rose 5.2 percent to 1,568 billion yen. Severe natural disasters in Japan as well as rising fuel prices also weighed on the firm's bottom line. But generally strong demand for both domestic and international air travel was supporting the firm's financial performance, the company said. The firm kept its annual forecasts for a net profit of 102 billion yen and an operating profit of 165 billion yen on sales of 2.04 trillion yen.